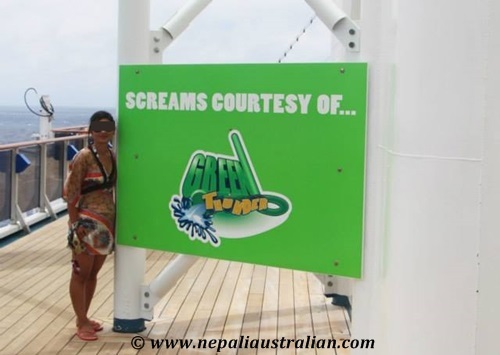 When I was doing the research for our holiday, everyone’s review talked about the new ride called Green Thunder on Carnival. 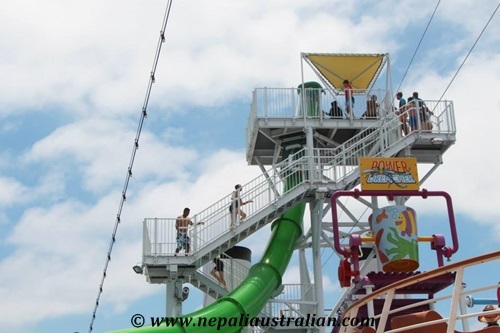 Everyone was saying thing that the Green Thunder slide is the highlight of the water park so I had already decided that I have to try it. I was scared but at the same time, I knew it was going to be fun. 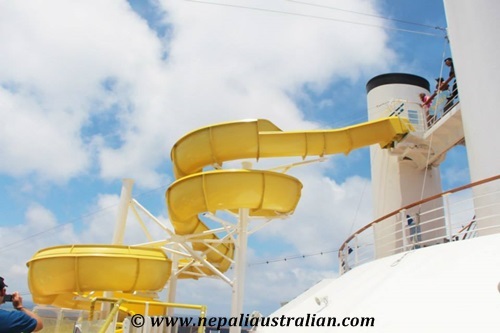 So on one of the sea days, I and AS got water ready and went to the water park at the top of the ship. I was intimidated and scared thinking of the floor dropping out from under me at the start of the ride but I decided to do it first to take the fear out of me. AS stayed on the bottom so he could take some photos and I walked the long stairs to the top. There was a short queue and in no time it was my turn. 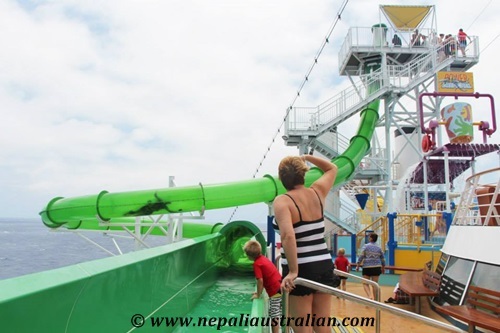 I climbed into the green capsule, crossed my feet and arms as I prepared to plunder Carnival Spirit’s Green Thunder, the fastest and steepest water slide at sea. 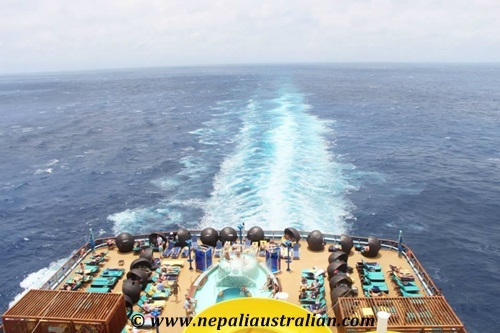 I was standing as high as any passenger can go on the ship. Then the countdown began and the floor just fell away; I felt like I was falling from the sky for a few second. 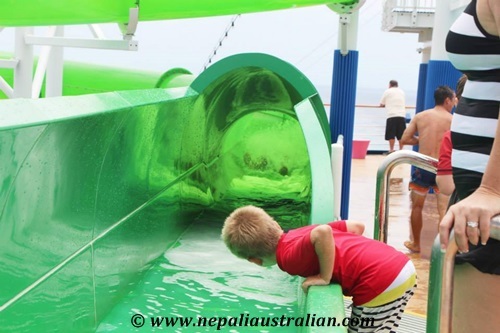 Then when I looked around I could see the sea through the green tube and I was on the edge of the ship with nothing between me and the ocean except a centimetre’s worth of green tubing and some flowing water. According to the experts, I was travelling at 65km/h. 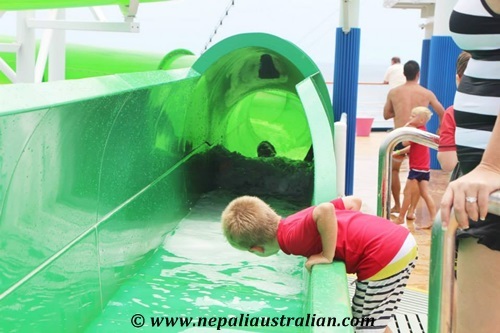 My scream hurtled with me down the green tube as did a I free fall. 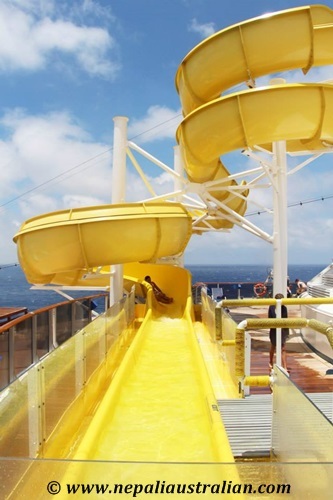 And in a few seconds, I was at the end of the slide. It was an adrenaline rush that pushed me to do more rides but I had to make sure AS had his turn as well. 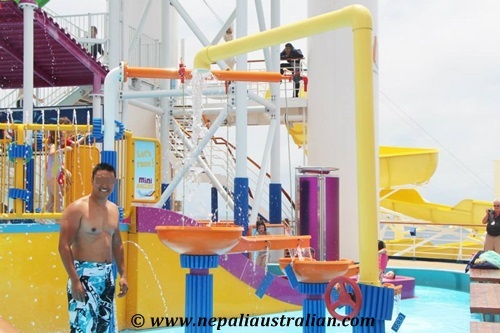 It is a surreal experience and very similar to the experience we had at water world and wet and wild before. He did the same process and this time I was capturing the moments for him. He was down in a few seconds as well and that was when we just got started. 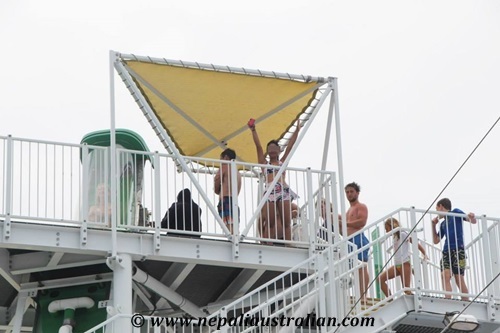 Unfortunately, Green Thunder stopped operation after a while as it was a bit windy so we went around the water park to find the other ride. There is a smaller version of green thunder called Twister. 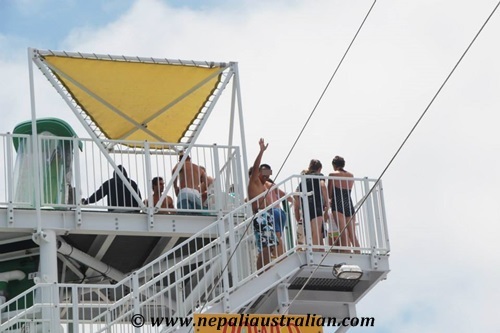 It is not as steep and scary as Green Thunder but still fun so I decided to go on it as well. After the monster one, it was a piece of cake but I went on it a couple of times as well as it was so much fun. 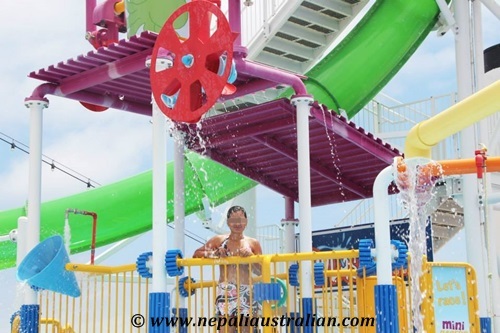 Then we walked around the kids area where there is a mini-slide and “splash zone” which comprises of a giant splash bucket that once full drenches everyone in its path below and some water fountains. We took a few photos before both of were chilled because of the strong wind. 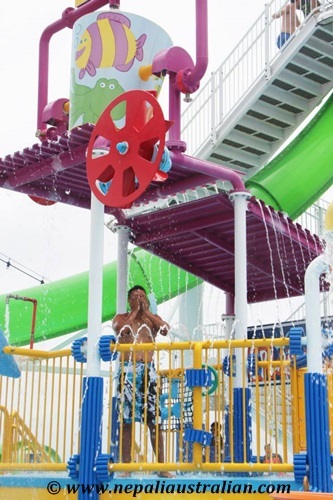 As much as it was fun to be on slides, once we were out of water, it was too cold. We didn’t want to catch a cold so decided to go back to our room for a hot shower. 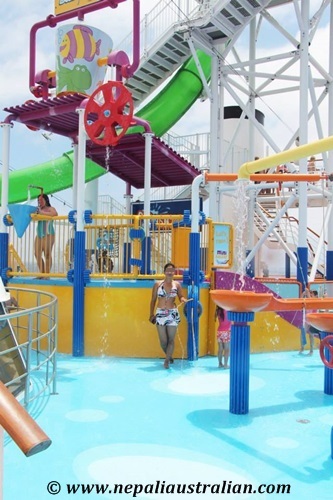 Both AS and I really enjoyed our time in the water park and we will recommend everyone to enjoy that area at least once if anyone is going on the same cruise. 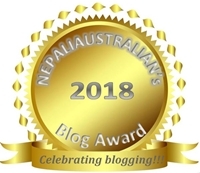 More about our trip soon. 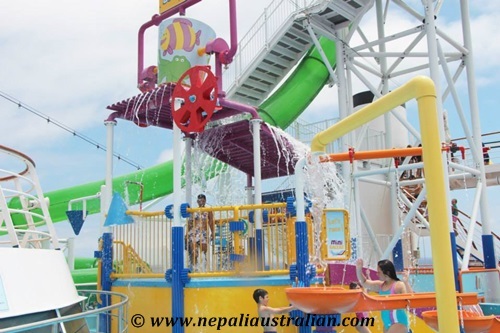 This entry was posted in Carnival Spirit and tagged australian, Carnival, carnival cruise, Carnival Spirit, carnival spirit review, green thunder, Nepali, nepali australian, Nepaliaustralian, twister, water park. Bookmark the permalink. Looks like you had a wonderful time! 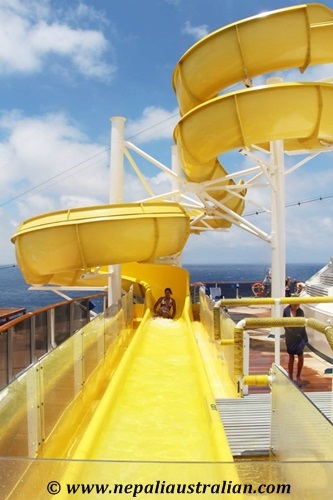 You made it look like so much fun that I am tempted to go on a cruise with water slides!